‘Digital manipulation distorts the truth’ and such phrases have been banded around by purists since digital cameras and software like Photoshop have become household norms. Wendy McMurdo has been using digital manipulation to her advantage since the technology became available. As opposed to distorting anything, the results have helped us learn more about ourselves than we might otherwise see. In a series of experiments in the nineties, Wendy photographed children playing their computers and musical instruments. 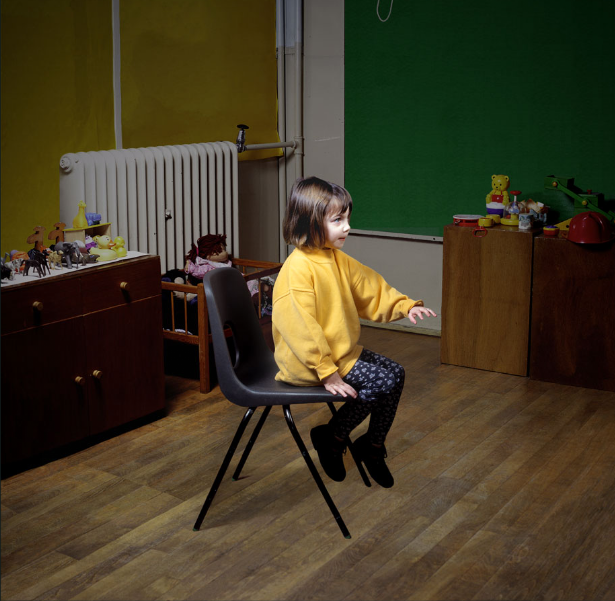 In postproduction Wendy removed the instruments and computers leaving the viewer to contend with children intensely absorbed in something invisible. By highlighting the concentration and trance-like state these children entered when absorbed in play, the impact is unnerving. 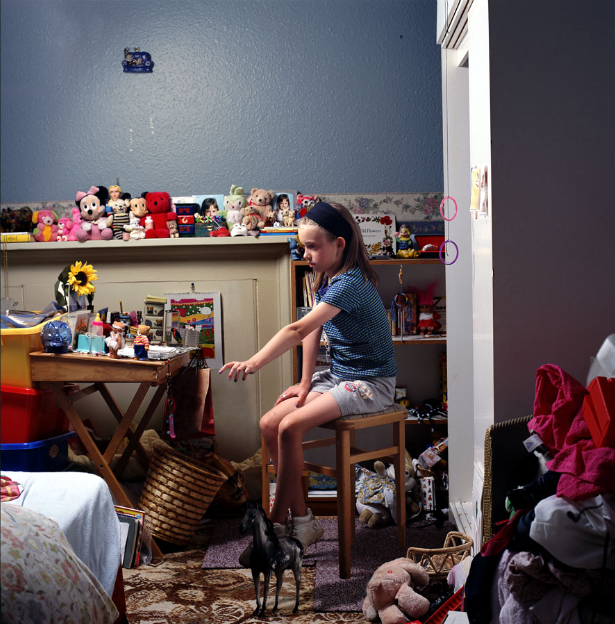 Instead of viewing photography as a one dimensional tool for recording ‘truth’, Wendy has shown us it’s capacity to observe and enquire, teaching us more about the psychological effects of childhood play than would first meet the eye. Rather than being intimidated by new technologies she shows us how to celebrate them. Wendy’s new work Artificial Intelligence concerns robots. An exhibition of selected works entitled Childhood, Fantasy and Play is currently on at Bath’s ICIA, where Wendy will be in conversation with Professor Vikki Bell on 16th Nov.
SB: As someone who has been at the forefront of utilising digital technology into your practice, I am interested to hear what you feel have been the main benefits of technological advances to the field of photographic art. WM: The last 15 years had been a period of huge shifts in the medium. There’s been change in almost every conceivable area of photographic practice. It’s challenging and energising. We’ve been forced to revaluate it all – from the ways we think about it, the ways we value it, to the ways in which we disseminate and of course, the ways in which we choose to view it. I think this revision has freed us up too. It’s allowed us to unshackle ourselves from the redundant hegemonies that have dogged photographic education in particular in the past. Do you think there have been any drawbacks? Not drawbacks – new challenges and new frontiers. Clearly technology doesn’t necessarily help people to think artistically. How do you feel technology and art compliment each other? All art is produced as a mirror to the technology of its time. Just as the impressionists created work that was made possible by developments in the mass production of transportable tubes for paint (allowing work to be produced out of the confines of the studio) so we too merely utilize and then reflect the changes in our technologically-driven world in our work. Do you think the photography world is becoming over saturated as a result of technology? What would be your response to someone who thought this? I think that editing has become a key motif and a central subject in and of itself. As artists who work in an environment saturated with imagery, editing must take on a more urgent role. Finally, where do you think photography might take us next? There are so many interesting strands to new photographic practice now. For me, book projects in particular seem to be really thriving. In our era of self-publishing, a lot of the most exciting work is coming out of a fairly informal, low-fi environment of artist-led publications. Artists can now realize projects, edit and publish them to a pretty high standard, and then fire them out into the world. There’s a wonderful democracy to this which seems at the very heart of the medium.